I have always loved flower crowns. When I was little I would tie together dandelions or string together honeysuckle flowers at my grandmother’s house and wear them around. 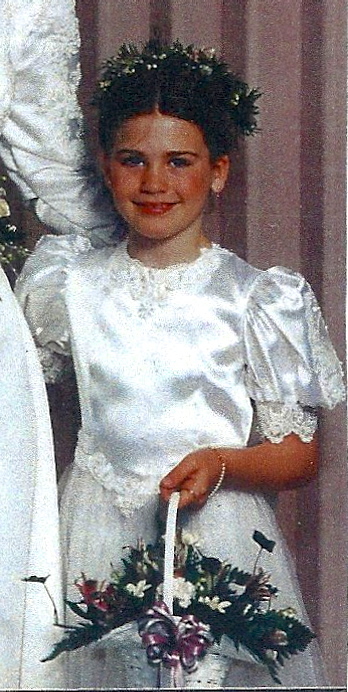 I just about died over the ones we had made for the flower girls at our wedding a few years ago, it reminded me of the one I got to wear to my Aunt’s wedding years ago! Now that the boho trend is back in full effect and I have been seeing tiny plastic ones for sale in all the stores, I knew I wanted to DIY a really big one. I had planned on making one with real flowers, but after figuring out how many flowers it was actually going to take I knew it would be too expensive and would only last a day or so. I went to the Hobby Lobby and found some silk ones that I liked because while they didn’t look as good as real ones, they were still pretty good and were 40% off so I got everything I needed for under $20. These are cool because you can make them obnoxiously big like this one or you can make it dainty and subtle. 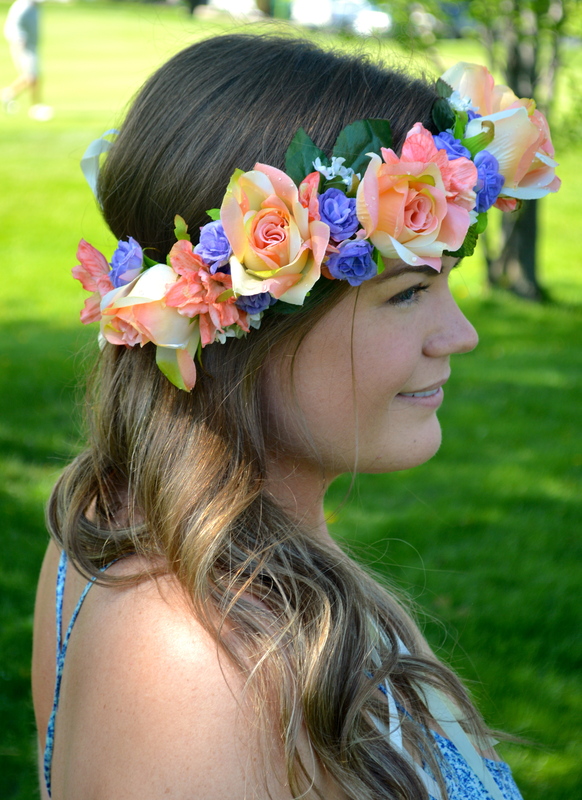 You can play around with different types of flowers and different colors and really customize this to your style. Start off by gathering up your materials. As I mentioned before, I got all of mine at the Hobby Lobby. I got two stems each of four different types of flowers. 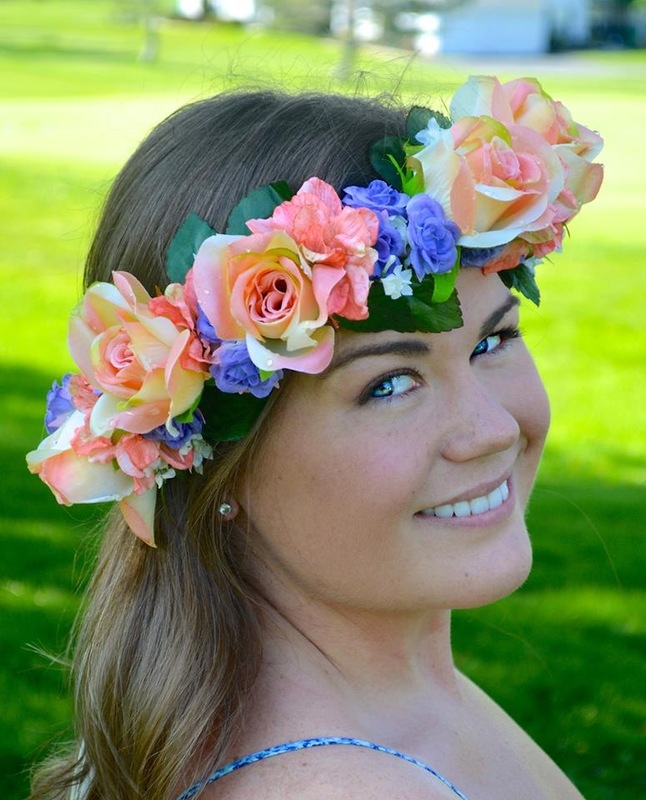 If you’re doing a big crown like this one, try to get some big rose ones and some smaller filler flowers. 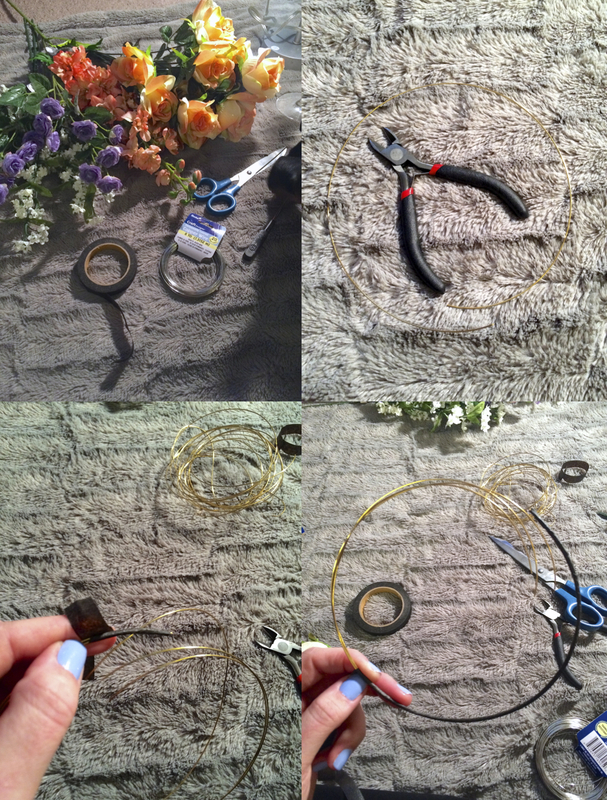 You will also need some floral wire (I used 20 gauge), scissors, floral tape and wire cutters. You will need to build the base of your crown using the wire. Measure one piece of wire around the front of your head, long enough that it leaves about a three inch gap in the back where you will tie it with ribbons. Cut two more wires the same length, so that you have three strands total and then wrap the whole thing with the floral tape. You’ll need to use your scissors or your wire cutters to cut the flowers off of their stems. For the roses, cut them as short up to the bud as you can because you will be threading them with wire to attach them, For the smaller flowers, leave a couple inches of stem so you can secure it to the crown with tape. Start off with a rose in the center front of your crown. Thread a small piece of wire through the base of your rose. Twist the wire around the crown base to attach it, making sure to do it tightly so that the flower doesn’t flop around. Add some smaller flowers on either side of the rose by taping down the stems onto the crown base. Add in some greenery from the stems to add fullness and also break up the color a bit. Continue working around the crown. I find it easiest to start with the rose in the middle, work out to one side and then the other to keep things looking uniform. 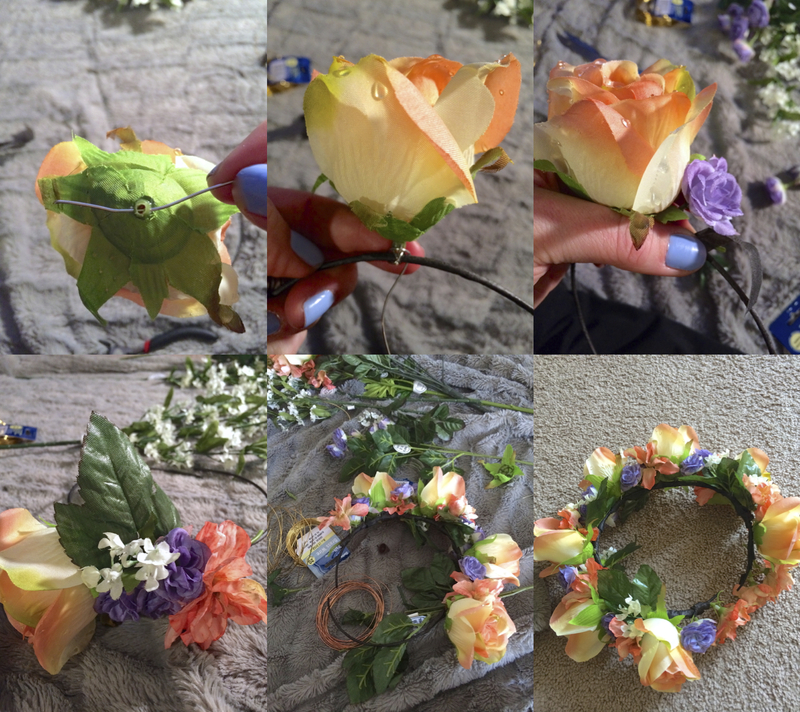 Keep working and taping until the crown is full of flowers and all the stems/wires are cover in the floral tape. Leave a tiny gap at each end of the crown base so that you can add some ribbon to secure your crown. I’ve always wanted to figure out how to make one of these! Love the colors you chose also, 🙂 . I gotta try this soon! It’s so much easier to make than you think! This is a fun craft ! And it turned out so pretty and feminine…. Thanks for the inspo..
Not yet Abby but I may start this summer! I will keep you posted!